In biomasses from 22 moulds isolated in housing buildings a Chromatographie HPLC UV/VIS analysis was carried out to assess the production of sterigmatocystin by fungal isolates. The results are discussed with respect to mycotoxic risk for people exposed to the presence ofAspergillus versicolor. This fungus is often present on building materials, but does not always produce the carcinogenic mycotoxin sterigmatocystin (ST). In this study, 19 (86%) of the 22 strains synthesized ST at detectable levels (>0.03 mg kg−1 biomass). Three of the strains (14%) were found to synthesize ST at levels exceeding 100 mg kg−1 of the air-dry mould biomass with laboratory medium. One strain proved to be highly productive and synthesized more than 500 mg kg−1 ST. Thus, it presented the highest mycotoxic danger for the dwellers of the buildings whereA. versicolor infested the walls. However, most strains are low producers of ST, with 12 of 22 isolates synthesizing less than 10 mg kg−1 biomass. 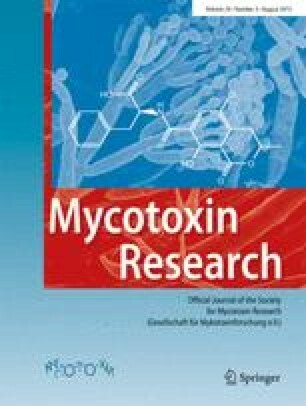 Mycotoxigenic and highly productive strains that produced significant amounts of ST (>500 mg kg−1 biomass) were less frequently found, with approximately 5% of all isolates from buildings studied for ST production.